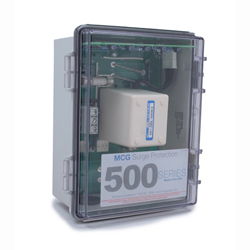 The 500 Series surge protectors are industrial-grade modular protectors for multiple AC applications up to 240 VAC, 1 pH. At the heart of the unit is MCG’s signature protection module that packs five high-current, thermally protected protection components for a total surge capacity of 100,000 amps. Parallel and series connected units can be ordered with or without a compact NEMA-4X enclosure.